For the second time in its thus far short life span, Google Messenger has a new name. The SMS chat app once known as Google Messages is now called Android Messages. The change comes as Google prepares for the wider adoption of RCS. Rich Communication Services is a next generation messaging protocol that builds on SMS and brings many of the features found in iMessage, including read receipts, active typing indicators and group chat, to non-Apple devices. In an interview with The Verge, Amir Sarhangi, the head of RCS at Google, said, “Android Messages is becoming more like Android itself.” That is, Google is taking a more hands-on approach with the platform. To that effect, the company announced on Friday that several third-party Android OEMs, including Motorola, LG, Sony and HTC, have agreed to bundle Android Messages instead of their own SMS solution. Moving forward, new devices from those OEMs will come with Android Messages as their default messaging app. One notable exception from that list is Samsung, which will continue to ship its own messaging app for the time being. Apple has also yet to announce whether it will adopt the protocol. Google is also working with carriers across the globe to get them on board with the Universal Profile protocol. 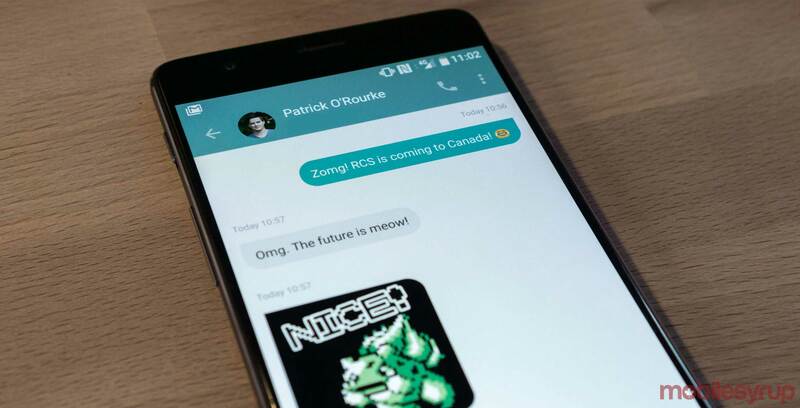 When it comes to that aspect of RCS, Canada is actually ahead of some countries like the U.S. Rogers started rolling out RCS to its customers late last year, and announced that all future Android devices sold by it and sub-brand Fido will come with Android Messages pre-installed. Meanwhile, both Bell and Telus have said they’ll add support for the protocol in the future. If nothing else, the rebranding makes sense for one major reason: previously, Google’s app shared names with Facebook’s Messenger, which was likely to be a stumbling block towards its adoption.